Bent, the party for gay ladies, gay men and gay friendly patrons, is putting on double-whammy bashes this weekend in Gauteng. 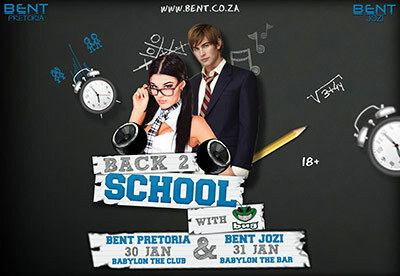 Celebrating the “back to school” season, they’ll be taking on Pretoria on Friday 30 January at Babylon the Club in Centurion and Jozi on 31 January at Babylon the Bar in Illovo. 3) Find the rebel, write a message on the rebel’s school shirt and receive your lunch box filled with goodies! 20:00 – 20:30: Free entrance if dressed according to back to school theme. BUG “For The Fun Of It”! BUG Blue, BUG Red & BUG Booster. BUG is the wildest shooter drink in the world.